Nearly 60% of all Americans who'd be interested in purchasing a gun are willing to buy a smart gun or childproof gun -- one that only functions in the hands of an authorized user, a new survey has found. The web-based survey of almost 4,000 people, conducted by the Johns Hopkins Bloomberg School of Public Health, found that 59% would buy a gun that used fingerprint detection or wireless technology to limit its use. In addition to overall support, the survey found that four in 10 gun owners and 56% of political conservatives surveyed would be willing to buy a smart gun, "debunking the widely used argument by gun manufacturers and gun groups that there is no market for smart guns," according to a Johns Hopkins statement on the survey. 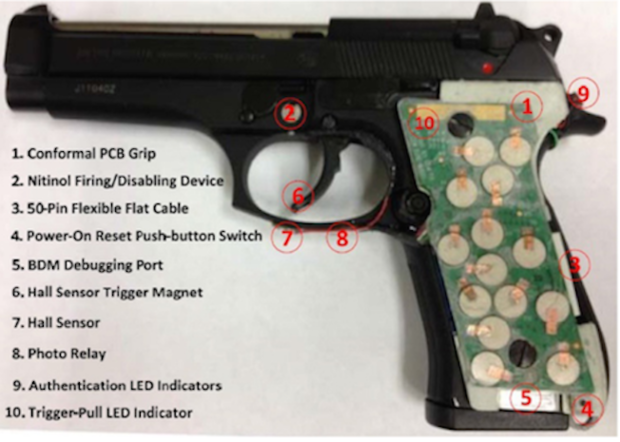 A 9mm Beretta semi-automatic pistol was used as the initial prototype for the New Jersey Institute of Technology's smart gun, which uses sensors to detect each gun owner's unique grip. "The results of this study show that there is potentially a large commercial market for smart gun technology," Julia Wolfson, a Ph.D candidate in the Department of Health Policy and Management, said in a statement. "This has been one of the biggest arguments against smart guns, that people just don't want them. This research shows otherwise." Earlier this month, in his State of the Union speech, President Obama spoke passionately about the need for greater gun control. Obama directed the Defense Department, the Justice Department and the Department of Homeland Security to conduct or sponsor research into gun safety technology, including smart gun technology. The president also instructed the departments to "review the availability of smart gun technology on a regular basis, and to explore potential ways to further its use and development to more broadly improve gun safety." Smart gun proponents, who've been developing the technology or lobbied the federal government in the past for funding, applauded the president's order, saying it's the only way to move the technology to market in the face of opposition by gun lobbying groups. The Johns Hopkins survey showed a shift in public support for the technology. The findings, published Jan. 21 in the American Journal of Public Health, appear to contrast sharply from earlier estimates derived from public polls. Research from 2013, funded by the National Shooting Sports Foundation (NSSF), found only 4% of respondents would buy a smart gun, while 10% would be "somewhat likely" to buy one. Eighteen percent indicated they wouldn't likely buy one and a whopping 64% said they would not buy one. Proponents of smart guns say their widespread use would cut down on suicides, stolen or borrowed guns that go on to be used in crimes, and accidental shootings of children by other children. In 2014, the most recent year for which final data are available, 33,599 people died in the U.S. from gun violence. The majority were suicides (more than 21,000 deaths) and firearm homicides accounted for more than 11,000 deaths, the Johns Hopkins researchers said. Unintentional shootings, in which children are often the shooter and/or the victim, comprised more than 500 deaths that year. In addition to fatalities, in 2013, more than 84,000 people in the U.S. suffered non-fatal gunshot wounds, requiring hospital or emergency room treatment, the study said. "By simply using technology that already exists and bringing it to the marketplace, the public health benefits could be enormous, allowing us to take a standard injury prevention approach to preventing gun violence," Stephen Teret, the founding director of John Hopkins' Center for Gun Policy and Research, said in a statement. Smart gun technology has been under development for two decades. Smart guns operate by using either embedded fingerprint readers or radio frequency identification (RFID) that only allows authorized people to operate the weapon. Some opponents of smart gun technology, however, are quick to point out that guns are simple mechanical devices made to work flawlessly when needed, and smart technology introduces the potential for failure. Smart gun technology has been in development for nearly two decades, but research efforts have most often stalled because of a lack of funding. When the technology has come to market, it has at times been met by vehement push back from gun rights groups who fear any adoption could lead to government mandates. Last year, Germany-based Armatix attempted to sell the first smart gun in the U.S. Its .22 caliber iP1 pistol debuted in one of California's largest gun stores. But it was quickly pulled from the shelves after some gun advocates pressured the store to stop selling the gun. Gun advocacy groups such as the National Rifle Association and the NSSF have said they do not oppose smart gun technology. They simply do not want the technology to be mandated. "We would continue to oppose mandates for this technology, particularly since there are well-proven existing methods to secure firearms, and firearms accidents are at historic low levels," the NSSF said in a statement earlier this month.